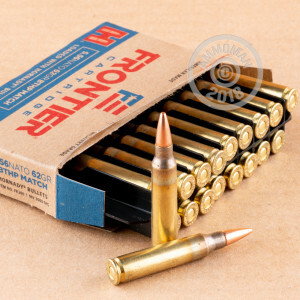 Hornady’s Frontier line of ammunition is accessible and versatile, of great use both to the novice shooter who’s learning the ropes as well as the seasoned marksman who can sense every subtle nuance of their ammo’s performance. It’s crafted according to the ammunition industry’s most modern practices and subjected to an intense quality assurance program before leaving the factory, so you can be certain that every round you fire represents the best that the iconic Nebraskan company has to offer. 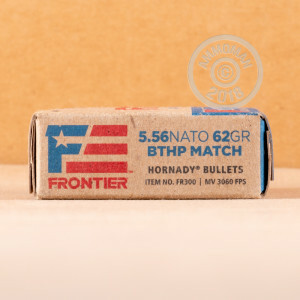 This 5.56x45 cartridge features a 62 grain projectile. The bullet owes its superior accuracy to more than the painstaking care with which it was produced -- it also features a boat tail design which dramatically increases its ballistic coefficient, giving it a flatter trajectory, lesser sensitivity to cross winds, and higher downrange velocity. The bullet is perfectly suited for target practice, but is in no way inadequate for self-defense thanks to its hollow point which will cause it to expand rapidly within human-sized targets.